It seems like every day a new type of digital advertising is unveiled – banner ads, Facebook ads, app ads, behavioral targeted ads, Pay Per Click ads — the list goes on. Each type supports brands in very different ways, but how do you know which ones to use and how to use them best? Technically speaking, re-targeting ads are delivered to a specific group of individuals based on predetermined actions that indicate how likely they are to convert to an ideal client. In other words, these ads catch lost conversions and place your brand or product back in the mix for a later decision. Maybe someone didn’t finish filling out a form or didn’t click on a phone number on your website — re-targeting ads follow those potential clients and reappear at multiple points in the buying cycle, ensuring that your brand remains top of mind from research to purchase. Depending on your target audience, re-targeting ads can be set up to appear on articles your potential customers read, in searches as they compare prices and in social media as they browse their friends’ updates. This steady brand presence can assure consumers of your position as an industry leader. Re-targeting ads are also hyper-specific — they can run in specific geographic zones and can be set to eliminate serial shoppers (people who frequent your website but rarely convert). A fun additional feature allows you to advertise directly to your competition’s clients with proximity bubbles on their locations; for example, if you’re a bakery, your ads could show up whenever someone gets within 500 feet of your competitor’s shop. These ads are a uniquely effective way to convert traffic into leads and work best when supported by a steady stream of traffic from SEO and other paid ad campaigns. It’s often the perfect addition to an existing digital advertising program because it converts any unused impressions into more customers! One reason these ads are so effective is they “recapture” the buyer at multiple points in the buying cycle. Ensuring that your brand remains top of mind from research to purchase. The ads appear in network on articles your potential customers read, in searches as they compare prices and in social media as they browse their friend’s updates. The steady presence of your brand reassures the consumer that your brand is the industry leader. This affordable tool is often the perfect addition to an existing digital advertising program, it changes unused impressions into more customers! 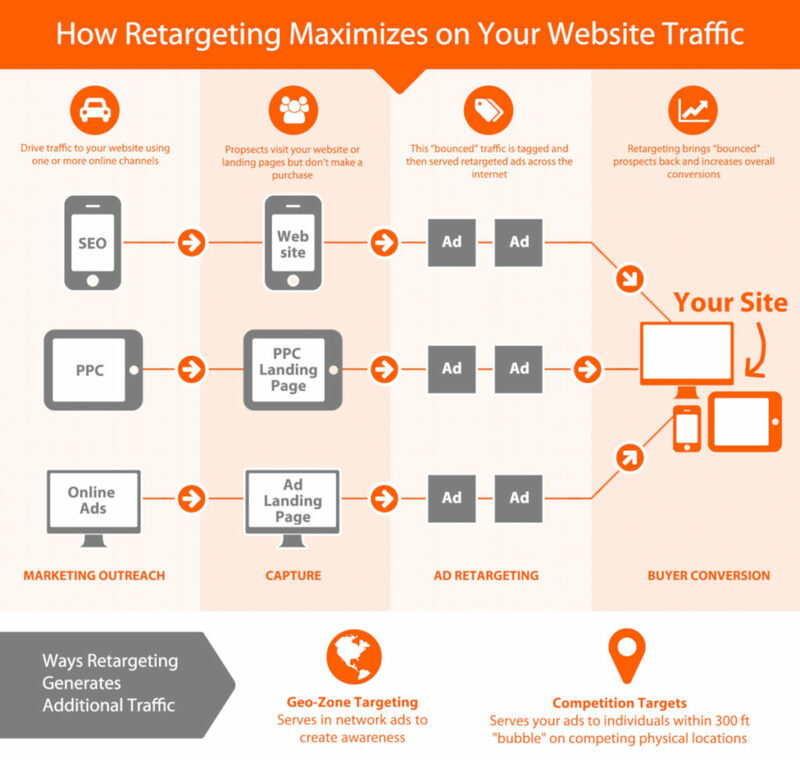 Could re-targeting ads be the right tool for you? Get in touch with us today to explore your digital options!